Most of the baseball world’s attention is directed toward Chicago’s North Side at the moment, what with the Cubs getting everyone’s hopes up before what will probably be another historic loss in the post-season (at least if the last 108 years of losing are anything to go by). But down on the South Side, the White Sox are making a big move of their own. Unfortunately, this big move probably won’t help the team’s own quest to return to the playoffs, but at least it’ll ensure that the people of Chicago maintain the carefully balanced level of apathy they tend to feel for the White Sox. That’s because the big move is a new name for the team’s home stadium, and much like when it made the transition from Comiskey Park to U.S. Cellular Field in 2003, this new moniker is a definite downgrade. 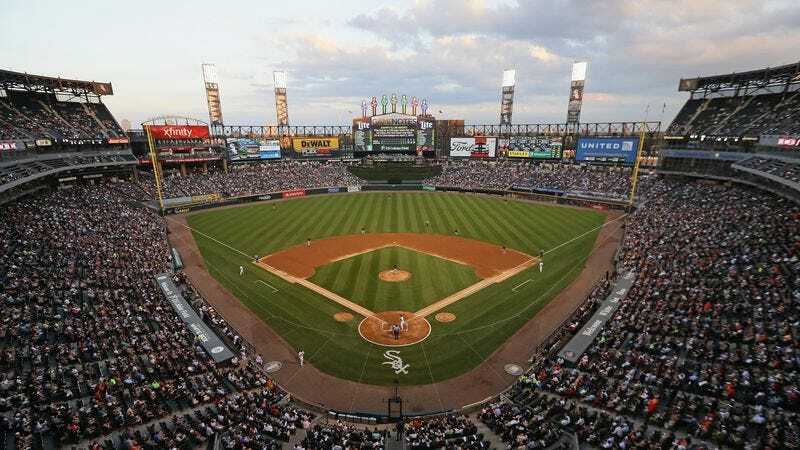 As of November 1, U.S. Cellular Field will now be Guaranteed Rate Field, which is worse in every way. That may sound hyperbolic, but let’s break it down: For starters, people came around to “The Cell” as shorthand for the old name, but Guaranteed Rate Field will just go by “GRF” or something similarly uninspired. You can’t even pronounce “GRF” as “Griff,” because that was the name of Biff’s evil grandson in Back To The Future Part II. Also, the team actually won a World Series under the U.S. Cellular Field name, which is an historically significant honor that not even the Cubs’ precious Wrigley Field possesses. Plus, Guaranteed Rate is even a lousy name for a bank, since it sounds like the off-brand Sam’s Club version of a real bank. It’s not all bad news, though, as the team’s agreement with Guaranteed Rate only goes through 2030. By then, baseball will probably have been replaced by some post-apocalyptic version of BattleBots, and these old stadium names won’t really be as important as the world’s dwindling supply of fresh water.